This is Market the Brew’s covert, cloak and dagger, Mystery Shopper episode. Our guest is “Sandi” – which isn’t our guest’s real name. Since the episode deals with the private topic of sending in mystery shoppers to a brewery, our guest has their voice masked to remain anonymous. Sandi is the taproom manager at a brewery that can accommodate around 400 people and is projected to produce between 16-18,000 barrels this year. The owners of Sandi’s brewery toyed around with the idea of having mystery shoppers to gauge their staff’s performance and day-to-day operation of the brewery. 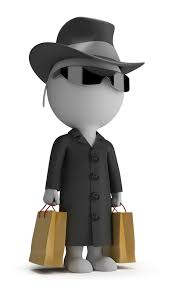 They were contacted by an agency that runs a mystery shopper service, and so they tried it out. Sandi notes that the shoppers weren’t brought in because they felt operations and staff were deficient in any way – they just wanted to see how they were doing, especially relative to other breweries in the area. The service the brewery uses is a craft beer industry-focused company: Secret Hopper. Secret Hopper starts with a standard survey of 25 questions, and then they give the brewery the demographic of who will be coming in. This is helpful because it lets men and women of all ages and levels of beer knowledge come in and give the brewery a wide field view of how the public perceives their beer and experience. Secret Hopper gives detailed reports of who came in and when, so the brewery can pinpoint what staff they interacted with. One big take away from this process was learning to simply ask customers closing their tabs if they’d like something “to go”. It’s been an easy, non-intrusive way to keep beer flowing and let customers know that they can take some of their beer with them. This brewery is in their 4th month with Secret Hopper and has found the information they provide invaluable in staying current in their growing beer market. Secret Hopper works with many breweries and makes suggestions for questions to add that can help them stay on top of their game and their taps flowing happily.